Every day at HalloweenCostumes is a new day full of well-crafted masks with fantastic colors and features. We see all kinds of shapes, sizes, and styles: spooky, funny, cute, gruesome, wacky--you name it. But one thing we've noticed is that many of these masks don't take into account the simple fact that human chompers are not all that intimidating. It's kind of a shame. Sure, we've got those pointy canines. But they're not quite big enough to be visible most of the time, unless you really go out of your way to show them off. 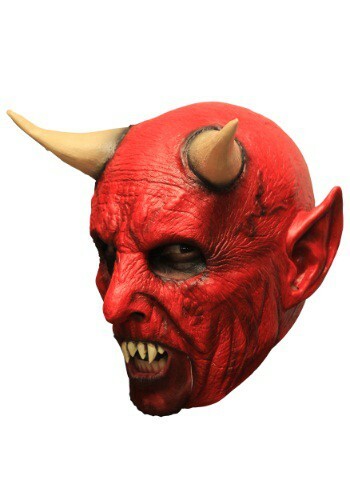 That's why this Demon W/ Teeth Adult Mask is such a great costume-topper. The blazing red skin, flared nostrils, and subtly curved ears and horns all work in concert to complement the extra-long high-contrast teeth, leaving your facial muscles free to relax underneath the latex. You'll thank us the next morning, when your cheeks don't feel all twitchy!